This four-day instructor-led course provides the knowledge and skills to develop web applications by using Microsoft Visual Studio and WebMatrix 2. The course introduces the Microsoft web stack and shows how to use WebMatrix 2 to develop web applications. The course will help students understand how start with basic web development concepts, and how to use existing applications from the Application Gallery. The course will describe basic web development, including CSS, plug-ins, scripting, basic data access, and application hosting. The course will also describe how to use Windows Azure for application hosting, and how to move beyond WebMatrix 2 into Visual Studio. The goal of this module is to provide an overview of web technologies provided by Microsoft for creating and hosting web applications. These web technologies include IIS, Windows Azure, SQL Server, SQL Database, ASP.NET, WebMatrix 2, and Visual Studio. After completing this module, students will have a high-level understanding of each technology and how it fits into the overall web stack, but they may not be able to provide detailed information. The goal of this module is to encourage students to adopt modern best practices in the way they organize a web application project. For example, they should understand the importance of planning an application in full, before they write any code. In addition, this module describes the high-level features of WebMatrix 2. The goal of this module is to introduce the students to the advantages of using a database to persist any data you may want to display on your website. The module introduces simple database concepts such as primary keys and data types. It also teaches how to add databases in WebMatrix 2 by using SQL Compact edition. Following this, the module shows how to add code to a Razor view to display the data that is stored in the SQL Compact database. The goal of this module is to describe how to build a compelling website by including media content. The students will learn how to display audio, video, and images both by using HTML5 and by using earlier standards. In the lab, images will be retrieved from a database and videos will be retrieved from a website folder. The goal of this module is to describe how professional developers apply branding, graphic design, and a consistent layout to a website. This is essential to create a good impression for site visitors and to attract them back for return visits. The module also discusses the importance of a clear navigation structure that enables visitors to locate the page they need rapidly. The goal of this module is to describe how a website is hosted for customer-facing purposes. The module discusses IIS web servers running on client premises and at ISVs and in single and multi-server farms. Windows Azure is also covered as a website host. The location data is stored for a production site is also considered. In this context, SQL Server and SQL Database are discussed. The students are then told about WebMatrix 2 Remote tools, which can ensure synchronization between the development and production versions of a site. The goal of this module is to equip students with techniques they can use for diagnosis and correction when exceptions and web error messages appear in their site. The tools covered include the developer tools in Internet Explorer and the Error List and Request tools in WebMatrix 2. Students also see how to configure their site to display a custom error page to site visitors, with a friendly, branded message. The goal of this module is to describe the many services available on the web that provide data in different formats, which may be of use to your web application. This module focuses on writing code that calls such services, and not on reusing open source components that call such services. Students will see example web services, data sets from the Windows Azure Marketplace, and oData feeds. They will learn how to reuse such data and assemble it into mash-ups. The goal of this module is to show the students that many highly functional open source packages are available within WebMatrix 2 through the NuGet tool. Developers can add, adapt, and use these packages in their application to implement advanced functionality without coding it from scratch. This approach can hugely accelerate the development of a web project. The goal of this module is to ensure that students fully understand common techniques an attacker might use to break a website and how to protect sites against such attacks. The module also describes how websites can authenticate a user to determine if they should receive a higher level of access to content. Students will learn how to enable users to manage their own passwords and how to create multiple user roles. Students will see that client-side code can execute without a full page refresh and so can respond much more quickly to user actions. This results in more compelling web pages. The module discusses about how to use AJAX Helpers to build partial page updates and introduces the jQuery library and its common uses. Finally, the module describes how developers can configure ASP.NET Caches to optimize the performance of their site. The goal of this module is to equip the students with techniques to increase the number of visitors who access a published site. The module begins by discussing how to analyze and understand who visits your site, when they visit, and what pages interest them. The behavior of search engine web bots is discussed and students learn how to ensure that their site is fully crawled and close to the top of search engine results. Finally, locations at which you can advertise your sites are discussed. The goal of this module is to show students that they need not rule out an application from the WebMatrix 2 gallery because it does not satisfy all the requirements a customer specifies. Instead, a developer can use an application as a starting point that meets a majority of customer requirements. Any gaps can be filled by adding extra pages and other custom features to the application. 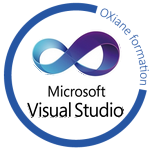 The goal of this module is to describe to the students why professional developers use Visual Studio as their principal Integrated Development Environment (IDE). Students will see the advanced features of the ASP.NET Web Forms programming model, which requires Visual Studio, and also see some details of ASP.NET MVC. Students also see the advanced debugging tools Visual Studio includes and understand how these accelerate code development, testing and troubleshooting. They will see how to add Web Forms pages into existing ASP.NET applications.